I started this blog in August and my first month was such a big learning curve. I have to say I got a whole lot of work done, even more than I had anticipated I would (or be able to) do. Balancing blogging with a toddler in tow, pregnancy, family life, friends, as well as work is not easy, but it is possible. But when starting a brand new blog with zero Pinterest followers (I’ll explain later) and no experience blogging whatsoever, it does feel a bit quiet waiting for your blog to take off. This post may contain affiliates. See affiliate disclaimer here. I obviously know it takes time to see results, so I did promise myself I will give it a year, work hard at it and not give up no matter what. And that’s what I’m going to do. So my second month blogging has brought with it a bit of encouragement, albeit small. Promise you won’t laugh when I share with you how much I made! I made $11.35 through Google AdSense. Now, Google Adsense doesn’t pay you out until you’ve hit $100 but I chose to put it in my income report because it may encourage a new blogger. I always love reading other bloggers’ income reports no matter how little or big it may be, because they inspire you. And those posts always come with great strategies and genuine advice, which any blogger (especially a new one) can totally use. And although $11.35 is not something I would typically get excited about making, I am super proud of myself and happy with it to say the least. I attribute that to the fact that it is my first time blogging. So I really did not expect to be approved by Google AdSense so early, let alone earn any money from it so soon. Mostly, it’s the fact that something is finally happening and that’s encouraging. If you’re in the same boat as me, I totally get it. Starting out a brand new blog is hard work and the to-do-list can be overwhelming, but don’t give up. You’ve got this! If you have any questions for me, holla at me in the comments below. Would love to hear your story and I’ll even give you a follow on Pinterest or whichever social media you need a bit of support with. Let’s be blogging buddies! So here is what I believe worked for me in my second month blogging and helped me earn my first income. Now, obviously, the main reason I made any money at all is because I started monetizing my blog. A lot of new bloggers are afraid to join any kind of advertising network or affiliate program because they feel their blog is too new and they don’t get a lot of traffic. Yes, there is a high chance you might get rejected due to low traffic when you apply too early. But I say, go for it and see how you go. You just might get accepted despite your blog being brand new (I did!). If you don’t get accepted now, you can always re-apply later. No harm done. If you’re after building a profitable blog, then start thinking about what you need to do now to get there (even if you know it might not happen straight away). Just make sure you set up a legitimate site for your blog (and by that, I refer to a self-hosted site). It is difficult to get accepted to ad networks and affiliates if you don’t have a self-hosted blog. Unless you buy your own domain, you won’t truly own your blog. Free blogs look unprofessional with your domain having a Blogger or WordPress domain attached to it such as www.example.blogspot.com. Buying your own self-hosted website will allow you access to various capabilities and themes you can customise to your liking which will also affect how professional your website looks. You will also have unlimited advertising privileges and never have the potential threat of your site being shut down by Blogger or WordPress. I use BlueHost and they’ve been good to me so far, though I know some bloggers have had issues with them. I have found their 24/7 live chat support very helpful. A lot of new bloggers use Bluehost or iPage for their cheap price, which is the main reason I chose Bluehost. I know I can change over to another hosting service like Siteground if I decide I want to pay more for better performance as my blog grows. Right now, I’m not sure I want to do that. Whoever you go with, you will get your self-hosted site, and be on your way to posting great content and building a profitable blog, slowly but surely. Check out my step-by-step guide to start a blog in less than 10 minutes. The second thing I believe has helped boost traffic to my blog is joining Pinterest group boards. I saw a huge increase in traffic (well, for me) and I attribute that to Pinterest. I joined up to 30 group boards. Yep, I had to send out a lot of requests via email and Pinterest (and that’s probably only about half of my requests accepted). So I would have probably requested to join up to 60 or more groups (I know, crazy right?). But I have to say it was so worth it. I noticed a huge difference in my blog traffic. I went from a little short of 100 page views in the first month to 890 page views in the second month. I know it’s peanuts for more experienced bloggers, but that’s huge for me. It’s the little wins that motivate me. If you haven’t joined Pinterest group boards yet, I highly suggest you do. When you pin to a group board, you are basically “borrowing” the group owner’s followers and getting more eyes on your posts. And it’s all free traffic. Just search for group boards that are within your relevant niche. Whether your niche is lifestyle, food, beauty or fashion, you name it, they are there. When sending out requests to join group boards, ensure you put your name, blog URL, Pinterest username and the name of the group board you want to join. You will also need to follow the owner of the group board in order for them to be able to add you to the group. You will find the group board owner is the first person located on the list of collaborators on the group board. Remember to read each group board’s instructions and follow their rules once you are accepted. Tip* To save valuable time, just copy and paste the same message (with all your relevant details), and only change the group board name before you send it out. Try to dedicate a good amount of time and get them all sent out. That way, there’s no procrastinating and you have one thing done and dusted (sorry, my productivity obsession coming out here). So besides joining group boards in my niche, which includes a few different areas (i.e. lifestyle, health, beauty and personal finance), I then went “pin crazy” by manually pinning all my posts. I did this at least a couple of times a day. The commitment is real guys! Then halfway through the month, I decided to try out Tailwind and BoardBooster because I have been hearing so many great things about both pin scheduling tools. Oh my word, where have you been all my life? Tailwind and BoardBooster were basically game changers for me. Just in case you have not heard about these powerful tools, both do the same thing in slightly different ways. In a nutshell, you schedule your blog posts to be posted out at different times of the day to your choice of Pinterest boards (your own boards and group boards). Then, you sit back (well, you get working on other important stuff like creating awesome content for your blog) and watch the magic happen. It’s pretty simple really. Now, I don’t have to do all the hard work of pinning til my fingers fall off. Yep, I can just schedule my pins for when I want them pinned and get on with other stuff I need to do for my blog. Let’s face it, how long can I keep up with pinning every blog post consistently to every group board multiple times a day? If you haven’t tried pin scheduling yet, you totally should get on board. It’s one of the best ways to increase your re-pin rate and therefore your blog traffic. You can get started with Tailwind for FREE here. There’s nothing wrong with signing up for both Tailwind and BoardBooster so you can see which one you like best. Just make sure you don’t spam those group boards. Try BoardBooster for free here. And that’s really all I have done differently this month and it has made such a huge difference for me. During my first month blogging, I must admit I didn’t do too much in terms of actually writing blogs or even promoting my posts. I had about 20 posts ready to go before I launched my blog, and I managed to post them out, create a Pinterest business account and pin them to my boards. But that was all I really did. My goal was to learn as much as I could about getting traffic to my blog and just generally getting used to the technical parts of blogging. And that’s exactly what I did. I read up on heaps of blogging topics from some amazing experienced bloggers. There is so much inspiration to work from home by starting a profitable blog. A year ago, if you had asked me anything about blogging, I seriously would have said it’s something people do as a hobby. It never occurred to me that there are people that make money (and huge sums of money at that) doing what they love. That they work hard at creating and building a business through blogging. I have found blogging to be a really great avenue for sharing what I love with others and of course, being able to write whenever I want (which I also enjoy doing). Personally, it took me a while to take the plunge and finally start a profitable blog. If you haven’t started a blog yet, here’s a rough guide of what I did in my first month blogging (to give you an idea of what it might involve). And I hope it gives you the inspiration and push you might need. Bought a self-hosted site and domain through Bluehost. Purchased Genesis Framework by StudioPress. Started creating my pages and categories. Posted up to 20 blog posts. Created a Pinterest business account and pinned my blog posts to my own boards. You can always switch your personal Pinterest account (if you have one) into a business account. I chose to create a completely different account since I wanted to start from scratch and wanted to keep it separate from my social life. Just my introvert tendencies I guess. That obviously meant starting out with zero followers, which was harder than if I already had a following. But I didn’t mind it, and I’m getting there building up my followers. Joined up to 30 group boards. Pinned manually to these boards and my own boards. Then, changed it up by using Tailwind and BoardBooster (got seriously time-efficient!). Applied for Google AdSense, and got rejected the first time. (They sent me an email stating possible reasons why they rejected my application, so I read that and thought hard about what could be missing, and fixed what I could fix. Applied again a few days later and got accepted. I am stoked that I got accepted into this program even though my blog is so brand new. Let me know if you have any questions relating to this). I also applied to join the Amazon Affiliate Program and got accepted – Yay! Signed up with MailChimp to gain email subscribers. Platform – This is where you get all the behind-the-scenes stuff done to create a great website, such as posting your content. WordPress is one of the most popular platforms. If you decide to go with them, make sure you go through wordpress.org (for self-hosted blogs) not wordpress.com. Host – The company that provides servers for you to house your website. It’s basically what makes your website a website. You can’t build a website without a host. Again, there are numerous companies that offer hosting services. This was the cheapest investment I made for a legitimate website of my own for only $3.95 per month with Bluehost. Domain – This is the name of your website (e.g. happyniftylife.com). Once you decide what you want to name your blog, you can purchase your domain from companies like GoDaddy. Click on the banner below to receive a FREE domain when you sign up with Bluehost. Genesis Framework – This is what makes it easier to create a website that is Search Engine Optimized (SEO). Basically, it provides you with everything you need to build a website and one that can grow to its full potential. Theme – Now this is what gives your website its unique look. It’s kind of like the cover of the book. And it’s the fun part of setting up your blog. It’s worth investing in a good theme that fits your niche and how you want your content displayed because it’s the first thing that people notice when they visit your blog. First impressions count, right? There are many designers that offer themes but my absolute favourite themes are provided by Restored 316. 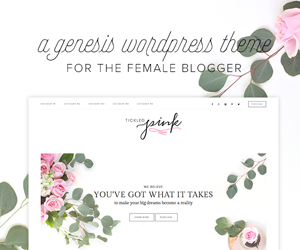 They have a huge collection of themes from feminine themes to more simple minimalistic themes. My favourite themes at the moment are Simple Charming Pro (the one I currently use), Dainty Theme, and Tickled Pink Theme. Once you’re done installing your theme, you’re ready to start posting your awesome content. Don’t know where to start? I totally get it. Though I’m not badly tech-challenged (if that’s a word), I found it super confusing when I got into actually setting up my blog. All the different aspects that go into creating a website such as hosting, platform and themes confused me even more. That’s why I explain how to start your own profitable blog right here. I even have pictures for every step because hey, if you’re anything like me, visuals make it so much easier to follow. As I have discovered lately, there is a lot to do – that’s for sure. But I’m proud of all the learning I have done so far. So, at the moment, I am focused on working hard but smart, enjoying the journey and going with the flow. Where are you at in your blogging journey? Whether you have just started out or haven’t hit “publish” yet, I would love to hear your story. Are you stuck for ideas on what to post on your blog?